After two solo round the world records (2004 and 2007), three Atlantic records (2005, 2013 and 2017), winning the Jules Verne Trophy (2017), and his recent victory in the 2018 Route du Rhum-Destination Guadeloupe, Francis Joyon and his loyal partner, the IDEC GROUP, are dreaming of new challenges with horizons beyond the Atlantic and the round the world course. Opening new routes, sailing away across the sea, reaching out to people, widening the usual definition of ocean racing, which can be somewhat limiting... These are passions shared by Francis and Patrice Lafargue, the founder and president of the IDEC Group, who already in the past created new records. Towards the Indian Ocean and Mauritius sailing between Port-Louis (Lorient) and Port Louis (Mauritius) in 2009, then to Brazil, with the Friendship Route between Bordeaux and Rio de Janeiro in 2014. The giant IDEC SPORT and her skipper Francis Joyon have decided to step outside their usual playground and head to Asia, a region of the world where few races have stopovers. 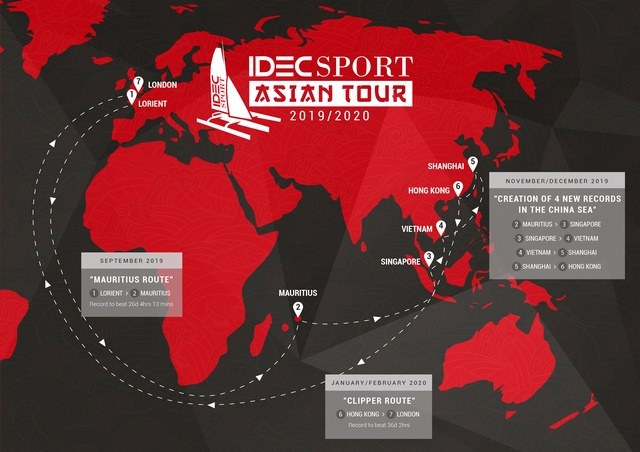 This latest record programme called IDEC SPORT-ASIAN TOUR 2019- 2020 will be aiming to tackle six major records including four new race courses between India and China, before they have a go on the way back at the legendary Clipper route from Hong-Kong to London. Before beginning this Asian programme, the winner of the 2018 Route du Rhum-Destination Guadeloupe will begin the season (May-June 2019) with a promotional tour in various ports around the Mediterranean during which he will attempt the Mediterranean record between Marseille and Sidi Bou Saïd (Tunisia). While today, there are no lands left to discover on the surface of the Earth, there are routes to explore, maritime history to rediscover and new records to be invented. 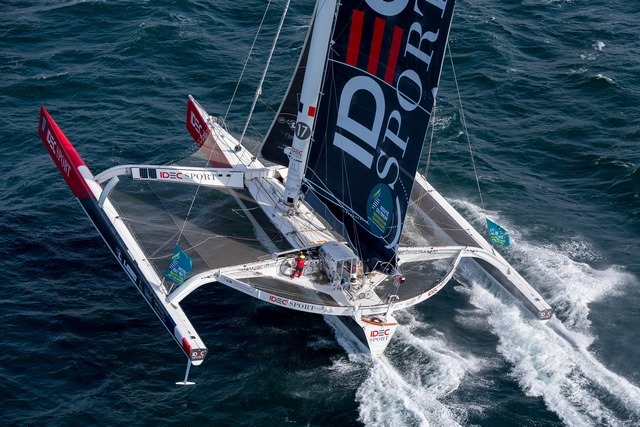 That is what the Francis Joyon's giant IDEC SPORT trimaran will be attempting next year in the context of the new record programme, the IDEC SPORT-ASIAN TOUR 2019-2020. January / February 2020 : Clipper Route / Hong-Kong London. 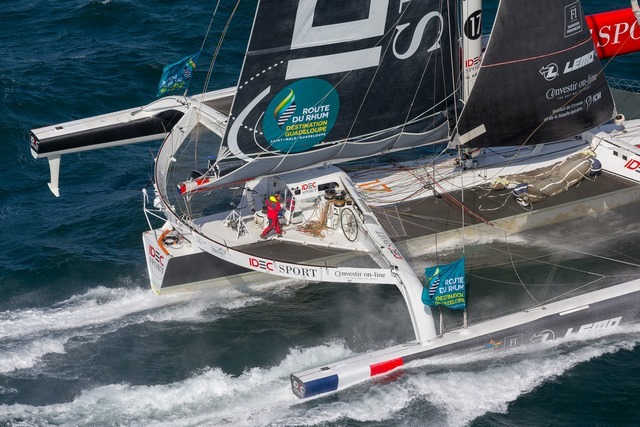 The French yachtsman, Philippe Monnet was the first in 1990, to set a reference time with a modern trimaran with a time of 67 days. Lionel Lemonchois grabbed the record in 2008 aboard a 100-foot catamaran, Gitana 13 with a time of 42 days. 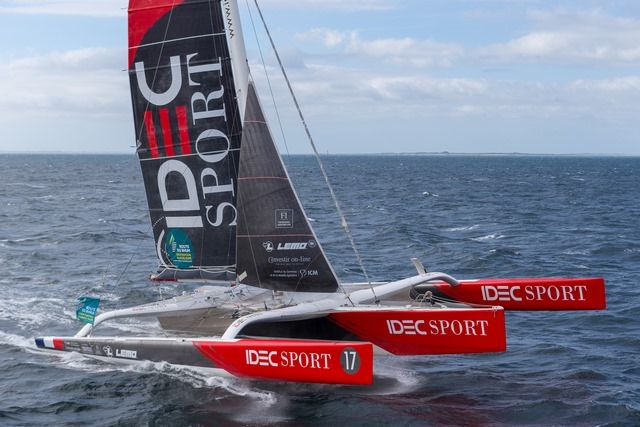 Since then, the time has been beaten and is now held by the crew of the trimaran, Maserati skippered by Giovanni Soldini, who was accompanied by two sailors we know well... Sébastien Audigane and Alex Pella, who were also part of the crew of IDEC Sport, when she won the Jules Verne Trophy with a time of 40 days in 2017. The Italian trimaran covered the distance in 36 days, 2 hours and 37 minutes at an average speed of 17.4 knots.